Created to coexist harmoniously with the rugged topography of its environment, Grand Velas Los Cabos is an oasis in the middle of contrasting landscapes: beautiful beaches, boulders, desert, and deep blue sea. 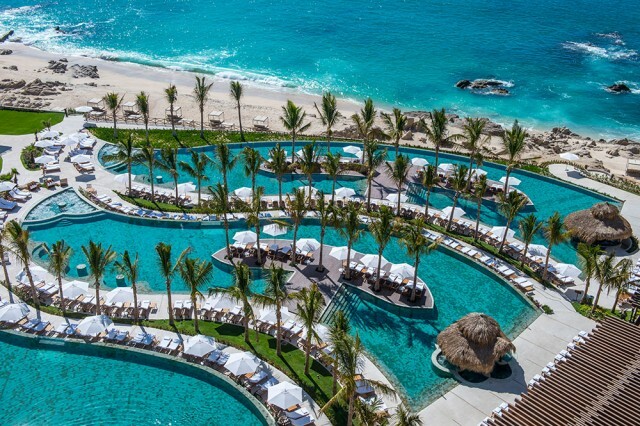 Ricardo Elias, principal of Elias and Elias Architects in Guadalajara, who designed the Grand Velas Resorts in Riviera Maya and Riviera Nayarit, returned to Grand Velas as the architectural designer for its Los Cabos location. Three infinity pools—designed as silhouettes of birds and fish—are the centerpiece of the resort. Constructed in a tiered fashion, with a five-foot difference between each level, they feature ample rows of loungers positioned so that every space is front row with unobstructed views of sea and horizon. Within the pools, islands boasting palm trees and wooden decks offer an ideal sunbathing experience surrounded by water. Jacuzzis are integrated into the corners of each pool and shaped to represent the head and eye of the bird or fish. Another special perk: The pools are kept at different temperatures to suit guests’ preferences of warm to cold.